By the early '60s it was no longer proper to be seen in a "mobil" trailing blue smoke. Demand fell, and more and more other machinery like drink machines alternately came off the F. M. R. assembly line. Parts stocks left over from the discontinued Tiger and Roadster found their way onto the production 200's. This Roadster has the standard 200 interior. Knott sent the final notice to his dealers on February 24, 1964. 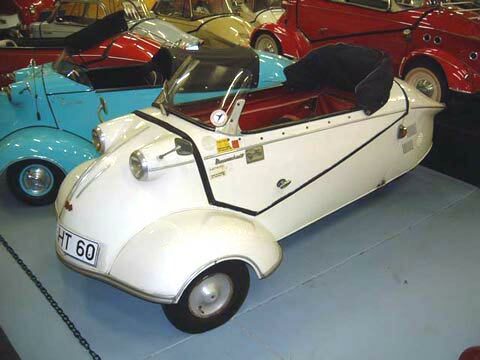 The last Messerschmitt to come off the line in August, 1964 was # 80,287. This car is #80,286- making it the second last Messerschmitt built. By this time, the "official" KR-201 Roadster with its snakeskin, portholes and fender lights, was long out of production, but the factory continued to offer this body style both on the Tg-500 and the KR-200: as is the case with this car. This car belonged to a well-known Messerschmitt enthusiast, Dr. Hans Dopjans. Weight: 240 kg Electrics: 12 v 3 Wheels: 4.00 x 8"